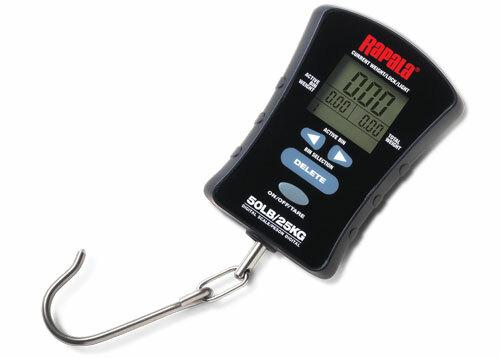 How to use the Rapala® Compact Touch Screen Scale RCTDS-50. To turn scale on, press and hold ON/OFF/TARE button until numbers blink 8888. To turn scale off, Press and hold ON/OFF/TARE button until screen goes blank. To store weight, add fish to scale using hook, the weight of the fish will show under CURRENT WEIGHT/LOCK/LIGHT. Use BIN SELECTION ARROWS to select desired bin. Press ACTIVATE BIN WEIGHT to store weight into selected bin. To delete weight select ACTIVE BIN to delete. While holding the DELETE button down, press ACTIVE BIN WEIGHT. The bin’s weight will flash, press DELETE again to confirm decision. To set tare weight, hang container that fish will be weighed in on hook. Press TARE, the CURRENT WEIGHT BIN will flash and set to zero. Press TARE to reset scale to zero. To change lbs to kg, press and hold ON button to turn on scale, while numbers are blinking, press the ON button again to select lbs or kg. Once selected, wait for numbers to flash. Now the scale is ready to use. 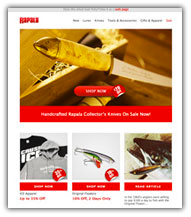 How to use the Rapala Compact Touch Screen Scale RCTDS-50.